Learning a new language is always difficult, but we hope that these tips should make it a lot easier and hopefully fun too! In this article has we have put together five tips which you can use every day and will help with word retention and accessibility. This can be great fun. If you have a big piece of paper draw the rough outline of a human body, then using your Spanish/English dictionary, write down as many Spanish words for parts of the body as you can find on separate pieces of paper, then fold the names into two and place them in a big bowl. Then with family or friends or even just by yourself, see if you can place all the names on the correct parts of the body. If you do this a couple of times a week you will soon have the major body parts in your vocabulary of basic Spanish words. The most difficult aspect of a new language can establishing a vocabulary that allows you express yourself accurately. My favorite way of getting to grips with basic Spanish words is to buy a large pack of sticky notes (post-its), then using a good Spanish/English dictionary go round the house writing the Spanish names for everyday objects on to your sticky notes and stick them on the objects. This means that every time you switch on the TV, pick up a book, play a CD or open a cupboard you can say out-loud the word written on the object. You can even do this on things like tinned foods, juices etc. One note of caution, avoid sticking paper to objects that get hot, you may cause a fire! If you are learning basic Spanish words it makes sense to follow the way children learn our basic language. If you have a local library, you could go down and get a couple of Spanish language kids books aimed at starter level. If you have children of your own you could read them together. You should not be embarrassed this is a great way to learn and develop, as your vocabulary develops then move up to books with a higher reading age. If you don’t have a local library you can buy second hand books online or you may be able to find some at your local bargain bookstore. Kids TV can is another great way to pick up basic Spanish words. There are many shows especially designed to encourage kids to learn Spanish. You can also learn basic Spanish words by using poetry fridge magnets. If you can't buy a tub of Spanish language poetry magnets locally they are available online.When you have them there are two games to play. The first is to construct Spanish sentences that look right, then translate them to see what random weirdness has been created or alternatively try to put together a proper poem using a dictionary. You could even use the magnets the way we talked about using sticky notes in the first paragraph. When you have a good idea of the basics of the Spanish language then a great learning tool can be the Spanish language media. If you straight into a Spanish language TV Channel or newspaper it might be too intimidating, so keep it simple to start. Look through your DVD collection and see if any of your films have a Spanish language setting. The better you know the film then the easier it will be for you to follow the Spanish dialogue. It is great is if you can find English language films with Spanish subtitles, the subtitles are usually simplified making them easier to read quickly, and easier for you to understand. 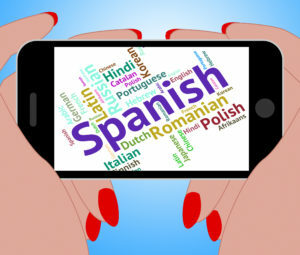 Thanks for taking the time to read this article, I think learning basic Spanish words can be a lot of fun, and I hope after reading this article you agree!